Purpose built to client’s special requirements with any number of inlets. Delivered to site ready for installation complete with access cover to suit application. Chamber: Vertical cylindrical watertight purpose built pump chamber with sewer inlet and discharge connections as required, in accordance with the data sheet attached. The unit is complete with cable and chain suspension bracket, access cover with frame moulded in or separate as required. The chamber is manufactured producing a minimum thickness of 6mm. Larger diameter chambers are reinforced in critical areas with horizontal ribs at adequate depths giving hoop strength and stability. Available Diameters: 600mm, 1000mm, 1250mm, 1800mm, 2500mm, 3000mm, 4000mm, all depths up to 9 meters. Pumps: Fully submersible of cast iron construction, directly coupled to a watertight IP68 submersible motor with flexible cable. An oiled filled buffer chamber with opposing seals in incorporated between the pump and motor. Accessories: Pipe and valves fitted within the chamber, giving a final connection to suit the rising main. Low level self-locating quick release coupling incorporating a 90° duck foot bend, guide rail and chain from the pump to the chamber head. 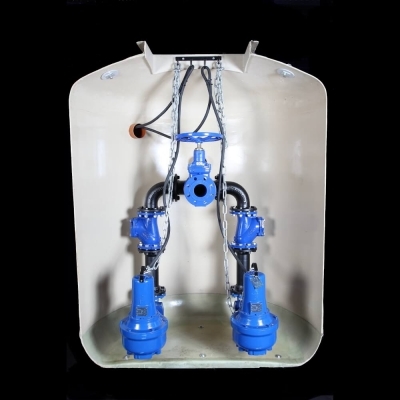 Alternatively, free standing pumps with flexible hose, quick release coupling and non-return and gate valve fitted to the final pipe section. Compartment with door interlocked mechanical and electrical isolator. Sets of motor fuses plus necessary HRC fuses for the control circuit, transformer etc. High level alarm lamp and buzzer. Note: For ‘Ex’ rated motors, high temperature klaxon cut outs and intrinsically safe relay circuitry fitted. Level Controls: Encapsulated float switched with suspension cables. Weatherproof Kiosk: GRP weatherproof kiosk with high level beacon can be supplied to house control panel.